I know people who hate mayonnaise. I know people who detest ketchup. But I know almost no one that hates mustard, and that's because mustard has a complexity and depth that bland mayo and ketchup do not. Mustard runs the gamut from smooth and subtle to sharp and spicy, especially when you know how to make your own. My first exposure to nicer mustard (basically anything that wasn't French's Yellow) were those commercials where a Rolls-Royce pulls up to another fellow fancy man who is about to dine (in his car!) and asks, "Pardon me. Do you have any Grey Poupon?" That is probably most of America's introduction to Dijon mustard, made with wine and originating from the Dijon region in France. Above: Original '80s commercial for Grey Poupon. An updated version, extended with an exciting car chase sequence, can be viewed here. While having wine in your mustard may seem refined and complicated, in truth, you can just as simply make it with beer or spirits. And the best part? It's super easy to make and to customize to fit your tastes. Plus, homemade, fresh mustard leaves the store-bought version way behind, taste-wise. Mustard is basically ground mustard seeds in some sort of acidic liquid, usually vinegar or wine. A shortcut is to use mustard powder, available in any supermarket, instead of mustard seeds. This is fine, but the time you're saving is so minimal that you'll be better off going the whole seed route: that way, you can control the flavor of the mustard. 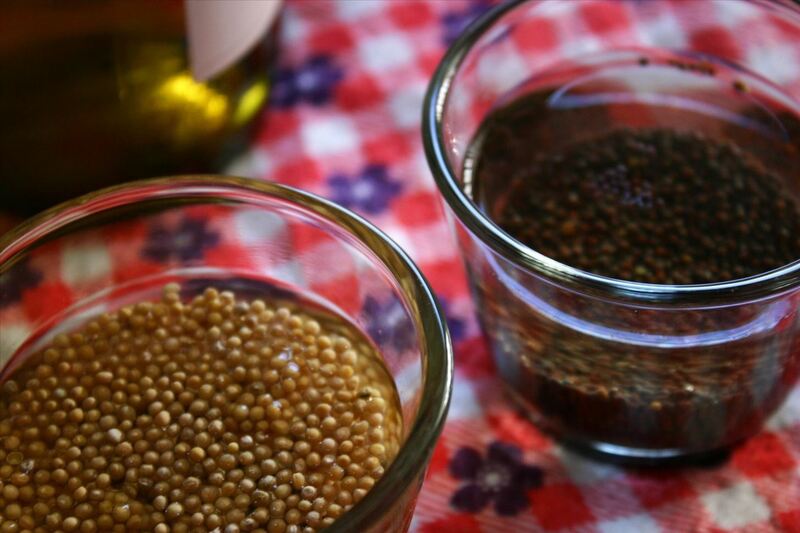 There are three types of mustard seeds, according to Noelle Carter in the L.A. Times. The first, and most pungent, are the tiny black mustard seeds. The brown seeds are more common and have less kick than the black ones. And the last group is the yellow or white mustard seeds. These are the mildest seeds, used in the ballpark yellow mustard that you probably grew up with. 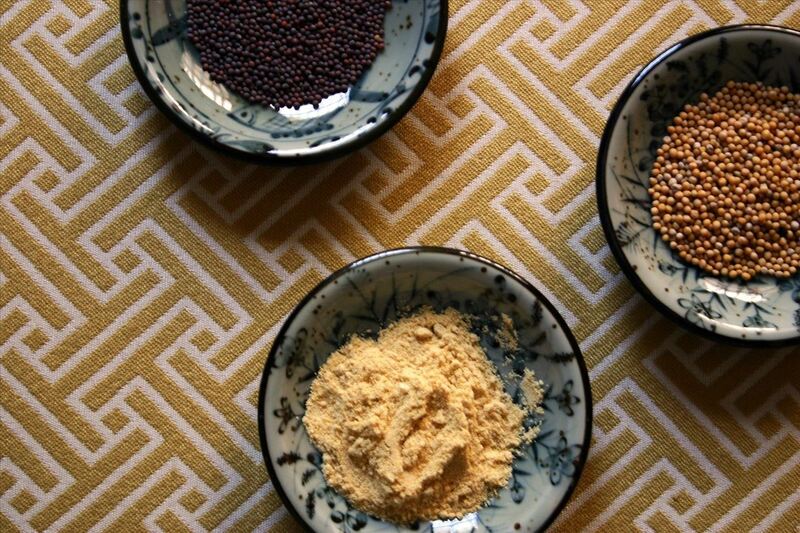 Top to bottom: Black mustard seeds, yellow mustard seeds, and mustard powder. You can just grind the seeds straight away when you buy them, but soaking them softens them significantly. Soak them in either cold water or cold vinegar until they're soft. They're a snap to grind once hydrated. You can even soak them in bourbon or wine to infuse the mustard seeds or alternately add the bourbon/wine/alcohol mixture to your crushed mustard seeds or mustard powder later on. Here is where you can really play with the flavors and modulate the kick that mustard is known for. Yellow and black mustard seeds soaking separately. Carter goes into even greater detail on the Splendid Table podcast, detailing the whole mustard-making process. For Dijon mustard, steep some minced garlic, onions, and herbs in white wine and then add the mixture to your pulverized powder mustard. Don't be afraid to try other wines or spirits. Sake or soju, for example, will give a deeper malted flavor to the mustard. After you're done mixing everything together... homemade mustard! Remember when making your mustard to use utensils and tools that are made out of glass, ceramic, and stainless steel. This is because your DIY mustard recipe contains acidic elements that can cause reactive materials like copper, aluminum, or iron to discolor or leach a little metallic taste into your food. David Leibovitz has a good run-down on reactive vs. nonreactive cookware here. Add diced fruits like apples or pears to give your mustard a sweet balance. We know about honey mustard, but what about maple or molasses? 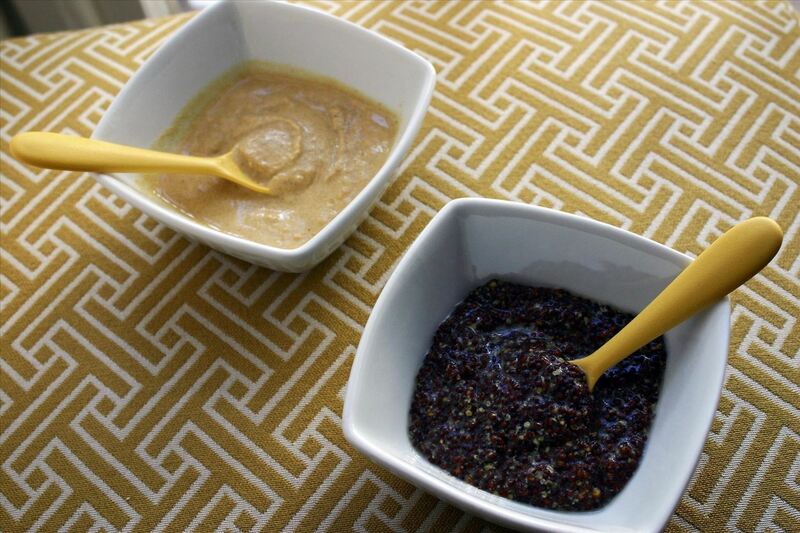 Herbs like thyme or fennel can add an earthy flavor to your mustard. There is no limit to what kinds of fruits, herbs, or spices you can add. And since mustard costs little to make, you can feel at ease if the first experiments don't (sorry) cut the mustard. Mustard has a fairly long shelf life when refrigerated, so you can gift your homemade mustard to friends or experiment with several varieties. Kaela Porter of Local Kitchen has some more advice on canning mustard. Keep in mind your friends' preferences. Maybe one has a favorite type of wine. Maybe another is a sports nut that deserves her own mustard for dogs and pretzels on game day. Or, maybe he likes spicy foods and this is your chance to knock his socks off. Now that you know how to make quick and delicious mustard, there's no end to what you can do!